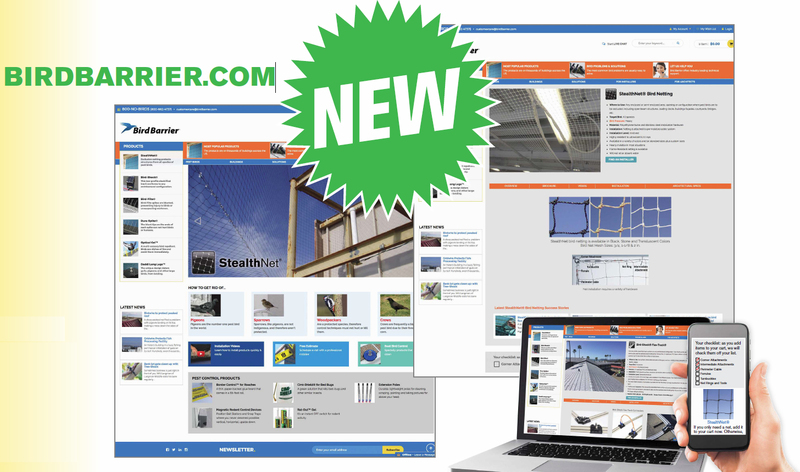 Bird Barrier America is proud to unveil its new and improved website, http://www.birdbarrier.com, bringing expanded resources and user-friendly efficiency to its customers using the latest online technology. Bird Barrier America is proud to unveil its new and improved website, http://www.birdbarrier.com, bringing expanded resources and user-friendly efficiency to its customers using the latest online technology. Since 1993, Bird Barrier has been America's leading manufacturer and supplier of pest bird control, specializing in innovative solutions to deter pest birds humanely and effectively. Its comprehensive product line includes industry favorites such as StealthNet®, Bird-Flite®, Dura-Spike®, Optical Gel®, Bird-Shock Flex-Track®, Eagle Eye and Daddi Long Legs®. Fresh New Design: Bright, clear text, photos and graphics make it easy for visitors to quickly find solutions to their pest bird problems. New Mobile-Friendly Functionality: Whether accessed via a computer, smartphone or tablet, our site is easy to navigate and use. More Ways to Get Help: Bird Barrier’s technical team can be contacted via online forms, email, phone, and now direct text. The company can even recommend a local certified installer to help solve your pest bird problems. Faster & Easier E-Commerce: The secure site accepts all major credit cards, PayPal and purchase orders from our established customers. Calculate shipping price before ordering. No hidden surprises. Problems & Solutions: One click takes you to the 20 most common pest bird problems, outlining all possible solutions using Bird Barrier’s comprehensive product line. Installation Videos: Step-by-step instructions will turn you into an instant expert. Quick Reference by Bird Type: Research your pest problem by bird species for easy reference solutions, including concise tutorials on identification, nesting/breeding patterns, damage implications, deterrents and control solutions. Research by Building Type: Search by building type or location for easy solutions, including deterrents, considerations and control products. Wish List: Not ready to order? Build, save and adjust your order over time while you complete your research. Up-To-Date News & Success Stories: Bird Barrier presents success stories for each product so you can see real successes in actual locations. Dedicated Installer/Architect Sections: Specifications and installation instructions for our complete line of products, including marketing tips and technical resources. A trusted industry resource, Bird Barrier looks forward to continued first-rate service for our customers.